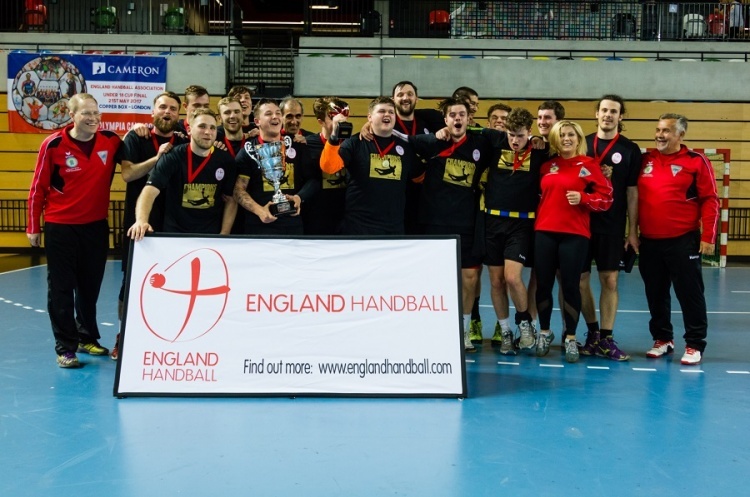 Defending England Handball Mens’ National Cup champions Warrington Wolves booked their place in the quarter finals with victory over Liverpool, while London GD beat Olympia in a thriller. NEM Hawks won at Bristol, last year’s giant-killers Oxford overcame London GD II, Nottingham came out on top against Brighton, West London Eagles edged a close contest with Manchester. Wolves led a 15-9 at the break against their fellow mens’ Premier Handball League side Liverpool. They maintained their six-goal advantage after the break as it finished 27-21. Wolves’ Ryan Thomas and Liverpool’s Filipe Santos top-scored with seven goals apiece. Wolves will play last season’s giant-killers Oxford in the next round after they beat London GDII 23-18. Oxford held a 17-11 advantage at half time. GDII edged the first half but could only reduce the deficit by a further goal as the match finished 23-18. The match between Olympia and GD finished 27-26 to GD in a nail-biter that went to extra time. The scores stood at 22-22 at full time, after Olympia had fought back from 8-12 down at the break. The first period of extra time saw GD lead 25-23, and they held on to win by a single goal. GD face Cambridge in the quarter finals after the East Anglian side won 33-24 at Carshalton Titans. Cambridge led 14-11 after the first period. The second half was slightly more comfortable as Cambridge scored 19 and conceded 13. Titans’ Regis Dore scored eight goals, while Cambridge’s top scorer was Dario Zanghirati with six strikes. NEM Hawks were comfortable 37-29 winners at Bristol. They were pushed hard by the Mens’ South West Regional League outfit in a first half where Hawks led 18-17 - before the North-west side pulled away after the break. Stephan Whaley grabbed eight goals for Hawks, while Jamal Braithwaite beat the keeper seven times. Nottingham will be Hawks quarter-final opponents. Francisco Pereria led the way for Nottingham with 10 goals as the East Midlands outfir beat National League South side Brighton 36-26. Jean Le Gal top scored for Brighton with seven strikes. West London Eagles won a close-fought match with National League North side Manchester. Eagles went into half time 15-12 up. Manchester made sure that the match went to the wire as they scored 14 goals in the second period to Eagles 13 as it finished 28-26. Manchester’s Hubert Kowalczyk top scored in the match with eight goals. Eagles will play Islington in the last eight after they won 36-17 at Leeds Beckett University. Islington were always in control, leading 16-6 at half time, and extending their advantage in the second half.